The Dormy House at Pyle & Kenfig is a self contained property situated within the grounds of the Golf Club, and is the perfect place to stay when playing at P&K and the Porthcawl area. 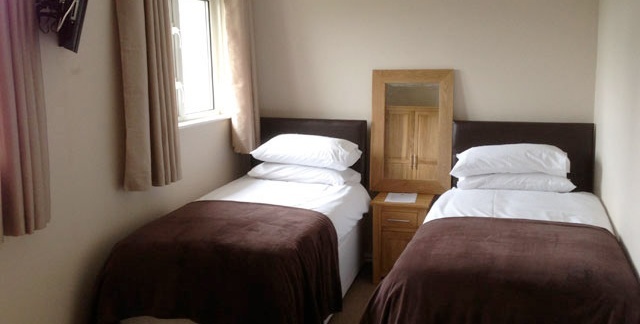 The Dormy House can accommodate up to 8 guests in 1 Executive twin/double and 3 standard twin/double bedded rooms; all rooms are of a decent size and ensuite with views out over Waun y Mer common. There is a fully equipped kitchenette area with tea/coffee making facilities and dryer. Your meals are served in the Clubhouse where Dormy guests have access to satellite television and the bar facilities. A stay in our Dormy House enables you to immerse yourself fully in the experience of links golf, with the luxury of being able to roll out of bed onto the golf course.